Over the past 12 months I’ve been working with my fellow historian Jay Young and the Wychwood Barns Community Association to organize Urban Transformations, a symposium about major urban issues and themes as they’ve played out along Toronto’s St. Clair West corridor. St. Clair has been an important artery for a century–2013 marked the hundredth anniversary of its connection to the city by streetcar–and in many ways a microcosm of the larger changes that have occurred in Toronto over that time. The weekend of June 20-22, a group of academics, journalists, architects and other urbanists will get together to discuss St. Clair West in its larger context. 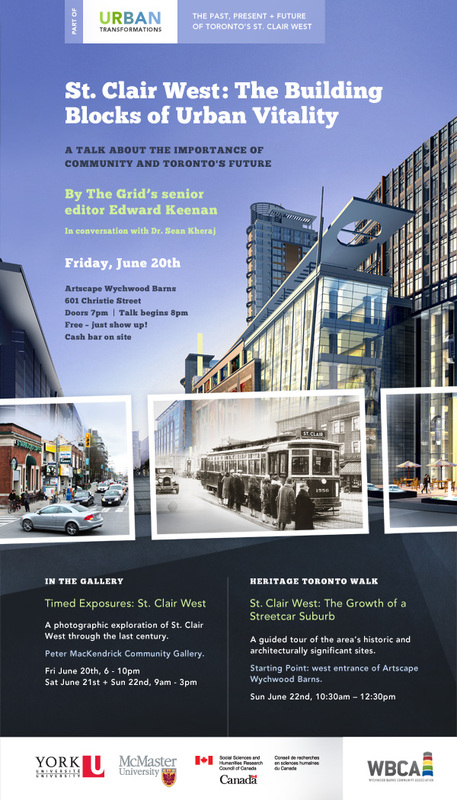 The event kicks off with a public lecture by Grid Senior Editor Edward Keenan on the evening of June 20th. He’ll be discussing ideas of community and neighbourhood and how they apply to St. Clair and the larger Megacity in 2014. Over the next two days, participants will gather in front of a small audience to discuss some of the big themes in urban life in Canada: work, demographics, structure, infrastructure, and arts & culture. Those conversations will be recorded and later placed online in open access, which we hope will stimulate a larger conversation with community members and the general public. There will also be an exhibit of photos of the neighbourhood over time, and an historical walking tour by Heritage Toronto on Sunday June 22nd. All of this is happening at the Artscape Wychwood Barns, a truly unique cultural hub in central Toronto. Our main sponsor is the Social Sciences and Humanities Research Council (SSHRC), but the event would never have been possible without the support of the Wychwood Barns Community Association and York and McMaster Universities. Working on this event has been a new and enriching experience. Jay Young and I both have experience organizing academic events, but this is something different. We are joined on the organizing committee by Michelle Mattern and Diane Mohan, two members of the board of the Wychwood Barns Community Association. And from the start we’ve done our best to make the event a dialogue between disciplines and professions, rather than simply an academic event. Each of our panel discussions features people giving very different perspectives along similar themes, and our audience will be similarly diverse. I think this kind of community-based event has a huge potential for all involved. Not only does it bring scholars out of the academy and into a public forum–where they can exchange ideas and gain a larger audience for their research–but it builds important bridges for future collaboration. We hope that Urban Transformations will be only the first of regular urban forums organized to bring scholars, urbanists, and communities together to share knowledge and build connections. 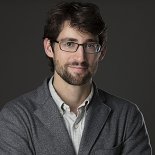 This entry was posted on June 11, 2014 by Daniel in conferences, public history, Toronto.